Ink2Go | Mac App Storeのアプリ検索・ランキング BuzzMac! 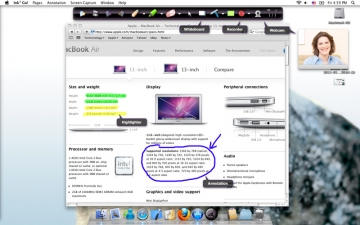 Ink2Go is an extremely simple and powerful screen annotation and recording software. Using Ink2Go you can easily write on top of any other application currently active on the desktop, even on a running video. You can then save your annotations as an image file or even record the whole session as a video for sharing. Ink2Go is a perfect tool for presenters to share ideas during a live session, for educators to create effective video tutorials and for salespeople to create impressive video presentations. With 1.3 update, the toolbar can be changed to span vertically. Go under the Ink2Go menu, the toolbar can be set to either horizontal or vertical orientation to fit your needs. 1. Keynote’s Presentation Mode – Users are now able to use Ink2Go in Keynote’s presentation mode, without the need to configure the settings in Ink2Go. 2. “Interactive Whiteboard” feature – Ink2Go can now readily support Keynote’s presentation on an iPad when it mirrors (with the help of Air Display) the screen of a Macbook or iMac, allowing users to turn their iPads into Interactive Whiteboards. 3. Global Hotkeys – Users can use the global hotkeys to easily switch between annotation mode and writing mode, showing and hiding of toolbar, toggling between whiteboard and desktop, and to show and hide web camera. 4. Sliding Toolbar – Users can now minimize or hide the Ink2Go toolbar to the side of the screen for easy later retrieval. 5. Whiteboard and Blackboard – Users can now choose either white or black background when they are in the Whiteboard mode. 6. Saving of Tool Settings – Ink2Go will save the tool settings before the program exits so that the users can conveniently use the same settings in later sessions. - Let you write, draw or highlight on any content being shown on the desktop from any app, be it a webpage, a slideshow or a running video. - Save the current desktop with your annotations as an image. - Record the desktop together with your annotations as a video. - Record your voice from the microphone. - Let you define a region of interest on the screen and only record within that region. - Allow pause and resume during a recording session. - Toggle the webcam view on/off for recording. For a video presentation, showing your webcam view might help you connect better with your audience. - Toggle between your desktop screen and a whiteboard with just a single-click. Helpful when you want to quickly show your idea on a clean page. - Let you create a new page to annotate without destroying the current annotations. You can easily go back and forth between the created pages. - Floating toolbar that can be moved around, so that it never gets into the way. - 8 pens, 4 highlighters and 3 erasers of various colors and sizes for your convenience. - Mouse mode that let you control other applications as per normal while your annotations are still showing on top. - Work with other presentation software like Apple Keynote and OpenOffice Impress.